All arrangements have been finalised for the grand opening of the Southern Expressway – the ‘Gateway to Wonder’ by President Mahinda Rajapaksa today, heralding a fast-track development drive in Sri Lanka. The Rs.77 billion mega project is the first expressway in Sri Lanka. “All arrangements are now in place for the grand opening of the Expressway this morning,” Road Development Authority (RDA) Chairman R.W.R. Pemasiri told the Sunday Observer. With the official opening of the expressway by President Rajapaksa who is also the Highways Minister, Sri Lanka’s first user fee expressway will be open to the public from 6 pm today, Pemasiri said. President Rajapaksa will open the access road to the Expressway from the Pinnaduwa interchange which links the Southern Expressway to the port city of Galle after buying the first ticket from the RDA toll collector. He will mark the opening of the country’s first Expressway by unveiling the commemorative plaque at Welipenna, one of the eight interchanges on the toll road. A public rally to mark the opening of the Expressway will also be held at the Karandeniya public grounds under the patronage of President Rajapaksa. A representative of the Government of Japan on Peace Building, Rehabilitation and Reconstruction in Sri Lanka Yasushi Akashi is also scheduled to participate in the opening of the Southern Expressway as a special guest. Japan provided 36.3 Japanese Yen (Rs. 47 billion) for the first 66 Km section from Kottawa to Kurundugahahetapma. The Asian Development Bank and the Government of Sri Lanka also financed the massive project. “We are opening the road for the public at 6 pm on Sunday after President Rajapaksa exits the expressway from Kottawa. We expect motorists to use the expressway from tomorrow,” he said. The toll for the complete journey for a car will be Rs. 400. The four-lane expressway which is to be opened up to Pinnaduwa will enable motorists to reach the port city of Galle within one hour at a maximum speed of 100 Km per hour. The minimum speed will be 80 Km/h. However, the maximum speed at exits and entrances will be 60 Km/h. The expressway will also make the Colombo Galle A-2 road congestion free for motorists who use it for daily travel. All types of vehicles barred from using the expressway, including bicycles, motorcycles, tractors, earthmoving vehicles, bullock carts and three wheelers should use the A2 road. “We have also made arrangements to ensure smooth traffic on High Level road which is the key road that links the expressway to Colombo city by making it a four lane road from Kottawa to Nugegoda. Our teams are now busy finalising the widening of High Level Road,” the RDA chairman said. The RDA is also widening the Battaramulla-Pannipitiya road, another access road to the expressway. The RDA has deployed over 500 staff for the 24-hour expressway operations. It will also have a fleet of Nissan Patrol and other emergency vehicles to respond rapidly to calls on the emergency line 1969. Meanwhile, the Police Department which is also playing a key role to make the Southern Expressway operational on a 24 hour basis (the road is well lit at night with luminous signposts in all three languages) has 500 police personnel exclusively for expressway traffic control, security, fire and rescue operations through its newly established Southern Expressway Police Division. Senior Deputy Inspector General of Police, Western Province, Field Force Headquarters, Traffic Administration and Road Safety, Asoka Wijetilleka told the Sunday Observer that they are also ready with their staff to make the expressway operational from today. He said police officers of the Southern Expressway Police Division will function independently under a Superintendent of Police. They have been trained for the purpose. On the instructions of the Inspector General of Police N.K Illangakoon they have taken steps to have additional Traffic police personnel to the Kottawa and Homagama police stations to control inbound and outbound traffic of the Southern Expressway on High Level Road. “With the heavy volume of traffic expected due to the opening of the expressway from Kottawa to Nugegoda and to the other side to Homagama, we will also deploy some extra traffic policemen to the Homagama and Kottawa police stations who will be deployed for traffic control on High Level Road”, he said. 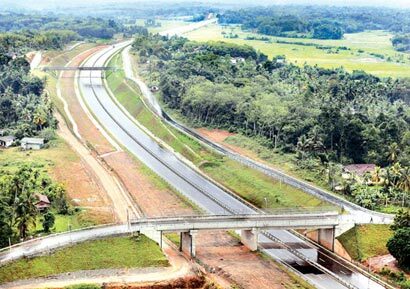 Lets congrats to all govt leaders to make the difference by providing new express highway…..its an good move..
Hearty Congratulations to UPFA government for building the first Expressway in SL! I suppose more such Expressways will be built in course of time linking Colombo to the North, Colombo to Kandy and Colombo to Katunayake. This is infra-structure building which is essential to economic development on fast track. Some people attacked the Budget 2012 as not ‘giving enough’ to the common man. This is a lie. It is the best budget so far in our history since 1948. People cannot expect the government to give hand-outs to all and sundry. Where is the government to generate its income from to run the country? It is through a fair taxation policy and from profitable State enterprises and public enterprises, tourism etc. As the country develops the government can be more and more generous. Countries that have natural resources such as oil have tax free societies. They also have free education, housing and health etc. We do not have oil at the moment but we already haave free education and free health. Sri Lankans should be grateful for this. Even the developed West with rich oil resource, such as USA, do not have free health and free education. All these moaners in SL do not know how fortunate they are, we have a sensible and fair government in UPFA, taking the country forward on the road to development and prosperity for all. half way. Ishall start all over again. an express Highway for the first time in our Mother Land. to National Prosperity,Peace and Harmony.